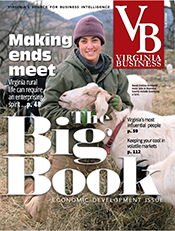 Virginia began with international investment. English investors funded a joint stock company to establish a colony in the New World. One of the earliest sites settled was the Citie of Henricus, now part of Chesterfield County. Will Davis, Chesterfield’s economic development director, likes to tell that story, with good reason. Chesterfield is getting one of the state’s largest international investments. Tranlin Inc., a subsidiary of China’s Shandong Tranlin Paper Co. Ltd., said in June that it would spend $2 billion to create an advanced manufacturing paper plant in Chesterfield that eventually will employ about 2,000 people. 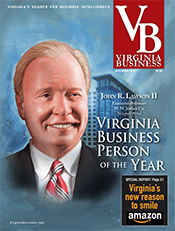 The announcement is another building block in Virginia’s portfolio of international companies. 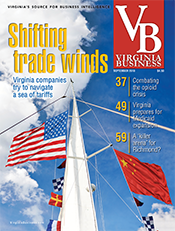 From the Port of Virginia in Hampton Roads to the office towers of Northern Virginia — and points in between — international companies have helped Virginia shine. 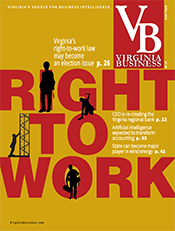 The Virginia Economic Development Partnership reports that Virginia now is home to more than 700 international companies. From 2009 to 2013, they invested about $4.4 billion in the commonwealth, creating 13,000 jobs. 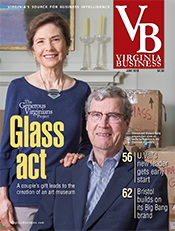 In Chesterfield, Virginia’s fourth most populous county, the strategy has been to pursue international companies in targeted industries. “One of our target areas is the food sector,” Davis says. For example, Sabra Dipping Co., the world’s largest hummus maker, has established a plant and research facility in the county. Sabra announced in September that it would double its production capacity, which currently is more than 4,000 tons a month. All told, Sabra has invested $150 million in Virginia and now employs more than 500 people. The company is a joint venture involving Israel-based Strauss Group and PepsiCo. Another food firm, Maruchan Inc., a subsidiary of a Japan-based company, employs about 450 in Chesterfield. Maruchan is one of the world’s biggest producers of ramen noodles and soups. International companies serving the food industry also have come to Chesterfield. For example, BluePrint Automation Inc., a Dutch company, makes packaging machinery. Ryan Losi, the executive vice president of the Midlothian-based accounting firm Piascik, agrees with Davis that recruiting one international company can encourage others to locate in an area. Favorable legislation also helps. During its last session, the General Assembly passed a bill to help international exporters in Virginia reduce their taxes. Losi believes the move enhances the commonwealth’s status as a leading economic contender in international trade. He believes investments in Virginia by China, already the major exporter and importer out of the Port of Virginia, could increase. Losi cites the Tranlin announcement and last year’s $4.7 billion acquisition of Smithfield Foods Inc., the world’s largest pork producer and processor, by Shuanghui International Holdings. “They’re looking to see how these deals go,” Losi says of major Chinese investors still on the sidelines. A beacon for international investment in the commonwealth is Fairfax County. Gerald Gordon, president and CEO of the Fairfax County Economic Development Authority (FCEDA), says the county began exploring opportunities for international investment in the 1980s, hoping to take advantage of the county’s location between Washington Dulles International Airport and Washington, D.C. In 1997, fewer than 20 foreign companies had Fairfax-based operations. Today, there are more than 400 companies from 40 nations operating in Fairfax. 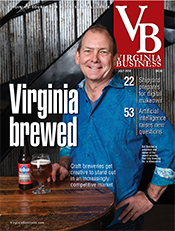 After the conference, a half dozen companies established offices in Fairfax, helping to launch a technology boom in the county. Fairfax now boasts 6,700 technology firms. About the same time as the conference, the county established its first international office in Tokyo. Today, FCEDA has offices in five countries. The Danville area has suffered some of the state’s highest unemployment rates since its textile and tobacco industries collapsed. Danville, a city of 43,000, is now trying to rejuvenate itself, in part by attracting international companies. 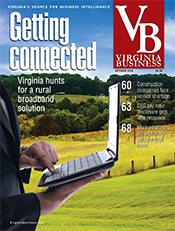 “International business has become a major part of the Danville economy. We have 10 international companies from nine countries in Danville currently,” says Telly Tucker, Danville’s director of economic development. “We’re focused on diversifying the Danville economy, so we’re not beholden to one large industry,” Tucker adds, recalling the approximately 15,000 jobs that were lost with the closing of Dan River Mills operations in the area and the downsizing of tobacco interests. By bringing high-speed broadband into the region and beginning a revitalization of the city’s River District, community leaders are hoping to spur a renaissance. Linwood Wright, a longtime consultant on economic development, says Danville has a long history with international companies. 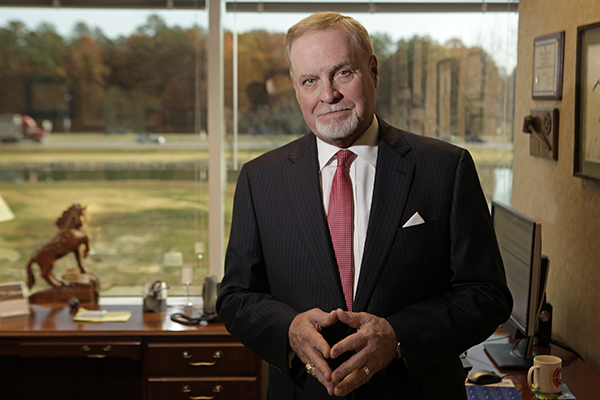 He says executives with Dan River Mills and the former Dibrell Brothers Tobacco, once the second largest independent processor of leaf tobacco in the U.S., traveled the globe meeting with customers and searching for new markets. In 2008, Danville made big news when Swedwood, the industrial group within IKEA, the world’s leading home furnishings retailer, located here. The 930,000-square-foot factory became the Swedish furniture maker’s first U.S. manufacturing facility. Wright says IKEA then helped recruit two of its suppliers, EBI of Poland and AXXOR of the Netherlands, to locate to Danville. EBI produces upholstered furniture and bedding accessories for IKEA, and AXXOR makes a honeycomb core that is used by Swedwood. 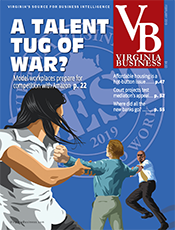 The same type of help by an existing company occurred in Virginia Beach, says Darryl W. Gosnell, president and CEO of the Hampton Roads Economic Development Alliance. He says one of the area’s longtime international companies — Stihl Inc. of Virginia Beach, a German company perhaps best-known for its chainsaws and other power equipment — assisted in recruiting two of its suppliers to the state’s largest city. 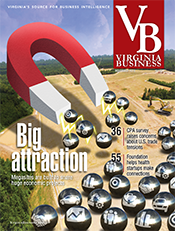 One of those suppliers was BMZ of Germany, the world’s largest producer of rechargeable battery pack systems, which opened its first U.S. manufacturing plant in Virginia Beach in 2011. The other Stihl recruit was Prufrex, a German manufacturer of digital ignition systems, which announced last year it was opening its first U.S. plant, in part because its two major customers — Stihl and BMZ Batteries — were already there. Stihl has 1,900 employees in Virginia Beach and recently marked its 40th anniversary as a Virginia company. “We have 140 international companies from 26 countries, and they employ over 21,000 local residents. That’s a big chunk of folks,” Gosnell says. One of the biggest attractions to the region is the Port of Virginia, which had a record-breaking year in terms of volume in 2013. 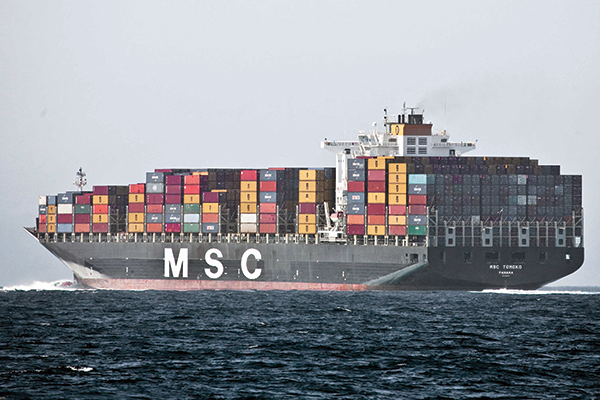 For example, the Mediterranean Shipping Co. has made Norfolk its first and last port of call for Asia, according to Mike Lehmkuhler, vice president of business attraction for the Virginia Economic Development Partnership. Mediterranean Shipping, based in Geneva, Switzerland, was operating 465 container vessels worldwide at the end of September. 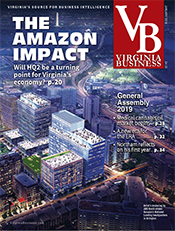 Lehmkuhler says that in the past two years Virginia has enjoyed a surge in international investment — $3.3 billion, and the creation of 6,700 jobs as a direct result. Many foreign companies face stagnant economies in their own countries, he explains, and they’re looking overseas. “They’re trying to build market share in the U.S.,” Lehmkuhler says. 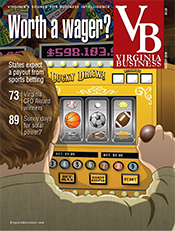 One of Virginia’s big challenges in attracting more international investment is the state’s own budget problems. The state faces a $2.4 billion revenue shortfall during the next two-year budget cycle. State employee layoffs and deep agency budget cuts have been announced. With limited state funding, the commonwealth can’t expand into more countries, and advertising has to be curtailed. “It handicaps us [internationally] from having a louder voice and a bigger footprint,” Lehmkuhler says.